At Hudson Creek Alzheimer's Special Care Center we know the lifestyle needs of seniors in Bryan, TX are as varied and unique as the community members themselves. That’s why we offer a variety of senior living options that enable our residents to live as independent a life as possible, while also keeping their well-being and comfort a top priority. Hudson Creek Alzheimer's Special Care Center offers several different services, including Memory Care and Respite Care. Memory Care: At the heart of our memory care program lies "Meaningful Moments®", a program designed specifically for family members with dementia, assisted living and Alzheimer care needs. We focus on honoring the life story of each individual resident, creating a touchstone for seniors struggling with dementia and other memory care issues. 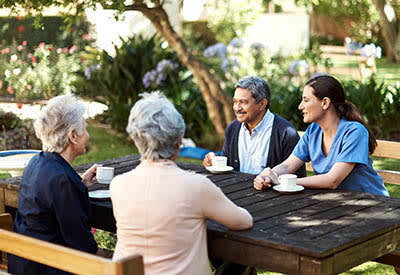 Respite Care: Everyone needs a break sometimes and respite care is the perfect option for the caregiver who may be feeling overwhelmed or a senior on the road to recovery but not yet able to care for themselves in their own home. Let us help engage and comfort your loved one as they enjoy a spacious room, three home cooked meals per day and countless social experiences among their peers. We offer a variety of floor plans to best suit your loved ones needs.